For some inexplicable reason I went backwards on this three-part Tube Family Tree series that appeared in Popular Electronics. 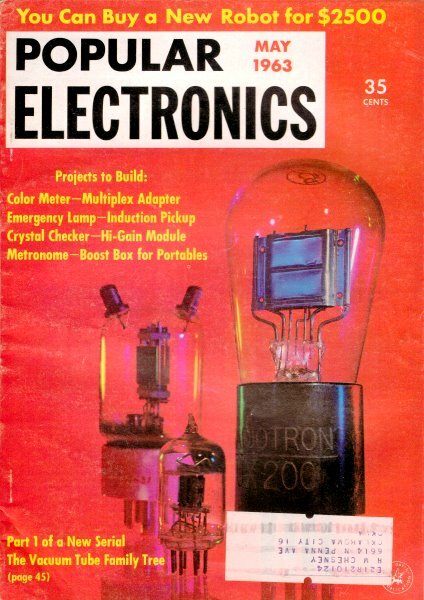 Author Louis Garner, Jr., starts out with the early history of vacuum tubes, beginning with Thomas Edison's incandescent light bulb and then quickly progresses to Lee de Forest's Audion amplifier tube, and on through the evolution of multi-grid vacuum tubes that are specially designed for low noise receiver front ends, high power transmitters, voltage and current regulators, video cameras, pulse forming networks, traveling wave tubes, and many other types. There is quite a bit of information and history contained in these three installments that will do a very nice job of introducing you to the wonder that is the electronic vacuum tube. Here you can read Part 1, Part 2 and Part 3. See all articles from Popular Electronics. There are some who say that the electron tube has been doomed by the transistor and its semiconductor "cousins," and that the tube, as the dinosaur, will become extinct. To these statements, the tube, if it could speak, might well reply in the words of the proverbial old man - I ain't dead yet. Actually, the tube is very much alive and kicking, with new types being introduced on an almost day-to-day basis, and handling more different kinds of jobs than ever before. The tube "family tree" is a vigorous, strong, and healthy growing plant. Let's examine it closely, starting with the roots and exploring the many branches and twigs. Birth of the Tube. 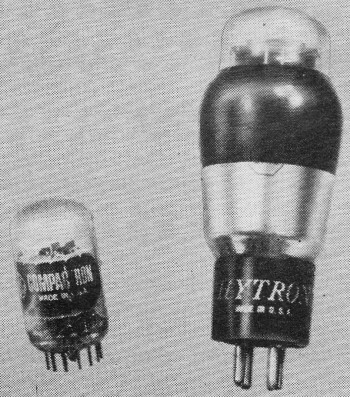 The electron tube had its beginnings in distinguished company. Thomas Alva Edison, one of the greatest inventors of all time, was experimenting with his newly invented incandescent lamp bulbs one day when he discovered a curious phenomenon. When he installed a small metal plate in his lamp bulb near the glowing filament, and connected this plate through a sensitive galvanometer to the positive filament connection, he found that a small, but easily measured, current flow took place. Unable to explain the reason for this at the time, he nevertheless realized that it might be potentially significant, so he obtained a patent in 1883 on what came to be called the "Edison effect." For many years, the Edison effect remained a classroom curiosity without any commercial value. Edison had, however, unknowingly invented the first true electron tube - the elementary two-electrode type we now call a diode. In the meantime, scientists in other fields had started a chain of events which, eventually, would have a profound influence on the application of the barely understood Edison effect. In 1887, Heinrich Hertz had demonstrated that electromagnetic waves operate in accordance with the laws governing light and heat waves, and described the basic theory upon which modern radio communication is based. Just after the turn of the century, J. A. Fleming, searching for an improved detector for electromagnetic waves, found that the Edison effect could be used advantageously. It was Fleming, then, who invented the first practical diode - the Fleming valve. The name "valve" stuck, incidentally, and, even today, electron tubes are called "valves" in most parts of the world outside of North America. The next great step forward came when Lee de Forest added a grid-like wire structure between the filament and plate of the diode, patenting his new device, which he dubbed the Audion, in 1906. It was de Forest who gave the electrical valve (or electron tube, as you prefer) an entirely new capability - the ability to amplify as well as detect weak electrical signals. He invented the triode tube, and, in so doing, laid the basic foundation for our great radio, television, and electronics industries. Three Basic Jobs. The electron tube's operation is relatively simple, once the idea of electron emission is accepted. Free electrons are liberated (or emitted) by the glowing hot filament. Since these elementary particles are negatively charged, they are attracted to the positively charged plate, moving across the intervening vacuum to it. This current flow is unilateral - that is, from filament to plate and not vice versa. It is this property which permitted the early Fleming valve to act as a detector. The filament, since it served as a source of electrons, came to be called the cathode. Later, this term was applied generally to any electron source in a tube (or other device), whether a filament or not. It all started with Edison's observation that electric current flowed back to the battery in this experimental light bulb. Over 20 years later, de Forest found he could control current flow by placing a grid-like structure between plate and filament. When de Forest added his grid-like wire between the filament and plate of the Fleming valve, he found that a small voltage applied to this structure could influence the plate current. Again, the operation is relatively simple. A negative voltage applied to the grid (as it came to be called, in deference to its original appearance) repelled the negative electrons and reduced plate current; a positive voltage applied to the grid attracted additional electrons and accelerated them towards the plate, increasing plate current. Since the grid, an open-like structure, intercepted few - if any - of the electrons moving towards the plate, its power requirements were very minute - but it could control a relatively large plate current. Thus, a small voltage applied to the grid was able to control plate current and hence amplify signals. The ability to amplify made another feat possible. Once a device can be used to amplify, a small part of the amplified signal can be fed back to the unit's input (grid). The device then serves as its own source of signal, and this feedback can generate alternating currents - so, it becomes an oscillator. With the addition of the grid, the electron tube became capable of performing the three basic jobs it has handled from the first decade of this century to the present day: detection, amplification, and oscillation. The Tube's Evolution. Fleming's valve was a two-element tube, or diode, and consisted of a filamentary cathode and a plate. 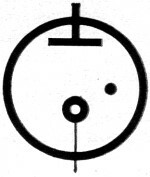 If, as was discovered, the filament is operated on 60-cycle a.c. line power instead of d.c., a certain amount of the line "hum" will appear in the plate circuit. This led to the addition of a separate cathode ... essentially a metal tube coated with chemical elements which emit electrons when heated. The tube is still a diode, however, with the indirectly heated cathode and the plate serving as its principle elements. The filament is reduced to the simple role of heating the cathode and, quite appropriately, is often called a heater. 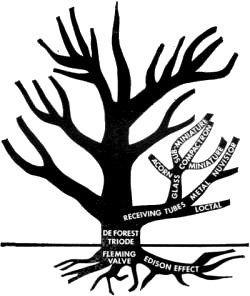 When de Forest added a control grid, the tube became a three-element device, or triode. In practice, the triode was found to suffer from a serious disadvantage when used as a tuned r.f. amplifier. There is a fair amount of electrical capacity between the grid and plate. This permitted a percentage of the signal in the plate circuit to be coupled back to the grid, setting up the basic condition for oscillation. Thus, early r.f. amplifiers tended to be quite unstable, and a variety of schemes were developed to neutralize the effects of grid/plate capacitance. In general, these consisted of introducing enough inverse (or negative) feedback from the plate tuned circuit into the grid circuit to counteract the direct feedback inside the tube and prevent unwanted oscillation. The next forward step came with the introduction of a second grid to serve as a shield or screen between the (control) grid and plate. By reducing grid/plate capacity, the four-element tube, or tetrode, permitted r.f. amplifiers to be assembled without special neutralization circuits. It was soon discovered, however, that the tetrode, as the triode before it, had a peculiar disadvantage of its own. For effective shielding, the screen grid was given a positive charge. This accelerated the electrons tremendously in their trip to the plate, causing the electrons to strike the plate with sufficient force to "knock" other electrons off the plate material. 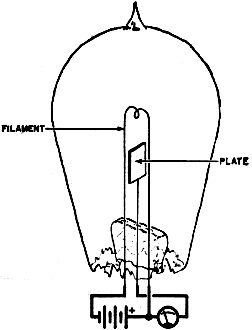 In a sense, the plate became an electron emitter, secondary to the cathode. With the proper combination of plate and screen voltages, more electrons would be emitted by the plate than were received by it, and these, traveling back to the positive-charged screen grid, caused a curious phenomenon. Under certain conditions, an increase in plate voltage would cause a decrease in plate current . . . as if the tube acted like a negative resistance. Again, the net result was instability and the tendency to oscillate when the tetrode was used as an amplifier. 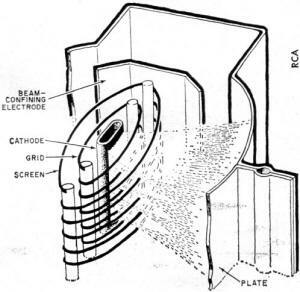 In an effort to reduce, or "suppress," the plate's secondary emission, a third grid was added between the screen grid and plate and connected back to the tube's cathode, creating the five-element or pentode tube. This third grid was called, appropriately, the suppressor grid. It served to repel the secondary electrons back to the plate without appreciably affecting the normal cathode-to-plate electron flow. Today, the pentode is perhaps the most widely used basic tube type. Somewhat later, it was found that a single cathode could be used for more than one function if additional electrodes were added outside the normal control range of the grid elements. This, in turn, led to the development of multi-purpose tubes. To make greater use of the stream of electrons moving from cathode to plate, this system of beam confining was developed. Practical all modern power amplifier types use these beam-forming plates. Beam Power Tube. The basic screen grid, whether in a tetrode or pentode, requires a fair amount of power for operation-power which does not, however, contribute to the strength of the amplified signal. Where very small amounts of power are handled, as in weak-signal amplifiers, the power loss is small and relatively unimportant. If a large amount of power is handled, as in tubes designed to handle several watts, then the power loss becomes significant, contributing to a loss in operating efficiency. 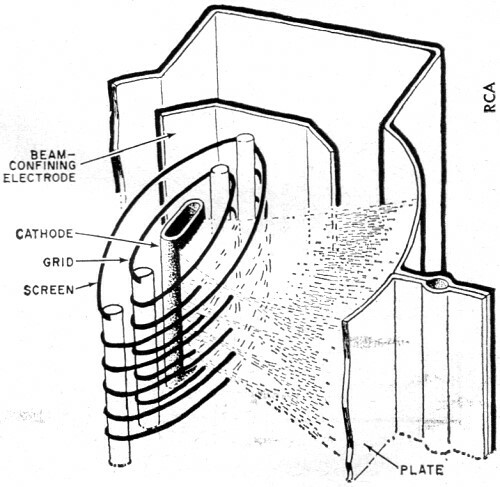 This led to the development of the beam power tube in which the control and screen grid wires were aligned in the same plane, so that the resulting flow of electrons was formed in parallel sheets or "beams" between the cathode and plate. Beam-confining electrodes were added to shape the resulting beams and confine the electron flow between the grid wires, thus preventing electron movement to the support leads on which the grids were wound. The resulting tube had much smaller screen currents than earlier tetrodes (and pentodes) with comparable power-handling ability, and thus was more efficient. At the same time, it was found that the beam power tube had much greater power sensitivity than earlier types. Today, beam power tubes are used extensively at both r.f. and audio frequencies where more than a few watts are involved. Gas-Filled Tubes. The majority of electron tubes are designed to operate within a vacuum, so that there will be no gas molecules present to interfere with the free movement of electrons between the cathode and plate electrodes. In fact, during the manufacturing process, a metallic substance is evaporated within the tube, forming a film on its walls and absorbing the last traces of gas: this element is called the getter. For some applications, however, limited amounts of specific gases may be introduced in a tube. Where a gas is present, the gas atoms can, under certain conditions, ionize; the gas atoms are partially stripped of their outer electrons and become positively charged ions. The gas ions move towards the cathode while the free electrons move towards the plate. Gas may be ionized by the application of heat and moderate voltages or by the application of relatively high voltages. This latter fact has led to the development of several types of cold-cathode tubes - tubes which do not require a filament or heater - the simplest examples of which are diode rectifiers such as the OZ4, voltage regulator tubes, and neon lamps. The presence of gas within a tube has several primary effects. First, of course, positively charged gas ions tend to reduce the tube's effective plate-to-cathode resistance, thus reducing its internal voltage drop. For this reason, gas-filled (generally, mercury-vapor) rectifiers are extremely popular where large currents are handled. Second, an ionized gas gives the tube an "all or nothing" characteristic. Until ionization occurs, relatively little current can flow. Once the gas is ionized, however, current reaches a maximum very quickly, and stays at that maximum value (determined by load resistances and supply voltages) until the plate voltage is reduced to a very low value or cut off altogether. Gas-filled triodes, or thyratrons, like gas-filled diodes, have an "all-or-nothing" characteristic, but with one difference. The difference is that the control grid in the thyratron, being relatively close to the cathode compared to the plate, can be used to "trigger" ionization even though the plate voltage is below the value normally required to ionize the gas. Thus, a small signal (or trigger) voltage applied to the grid can switch the tube from a non-conducting state very quickly. Thyratrons are used extensively as relaxation oscillators and for control and switching applications. A number of gas-filled cold-cathode triodes have been manufactured for special applications. Their operation is somewhat similar to that of the conventional thyratron, except that no filament is used. The most familiar example of this type of tube is the flash tube used in photographic electronic flash lamps. Receiving Tubes. By far the most popular general class of tubes are low- to medium-power types primarily designed for use in radio and television receivers. This general class encompasses all the basic tube types-diodes, triodes, tetrodes, pentodes, beam power, and multi-purpose tubes. In the early days, there was little need to identify tubes except by their manufacturer's name, for most units were essentially the same. Later, as more types were developed, identifying type numbers were introduced. These served to identify a particular type of tube in terms of its characteristics, permitting tubes produced by different firms but having the same type number to be used interchangeably. The first type numbers were simple numerical designations, such as 01A, 15, 19, 20, 42, 45, 76, and 80. As more and more types were developed, a different numbering system became necessary. The tube manufacturers decided to adopt a system of numbers and letters such that the type number itself would give an indication of the tube's basic application. With this system, the first number would indicate the tube's nominal filament voltage, a middle letter the intended application (amplifier or rectifier, for example), and the last number the number of active elements. Amplifier type tubes were to receive letter designations from the first part of the alphabet, rectifiers from the end of the alphabet. Multiple triode sections in one glass envelope are not as new as you might think. 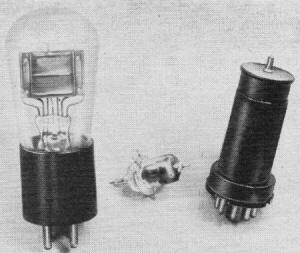 The 6A3 tube of the 1930's (right) had two triode sections, but they were wired together. The current compactron (left) has three triodes in its envelope, and each grid, plate, and cathode goes to a separate base pin. Gone but not forgotten are these three pioneers. 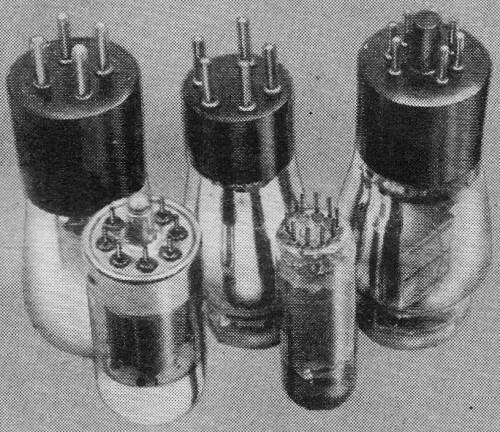 The 200A (left) was one of the first mass-produced tubes. A 954 Acorn helped introduce VHF to communication services. At right is an 1851, a super-high-gain tube developed just before World War II. 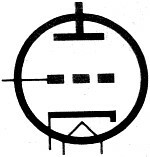 As the internal structure of vacuum tubes became more complex, the necessity arose to provide pin connections. Here are some examples of the changing styles from 1925 to 1963. Along the back row (left to right); 4-pin and 5-pin tubes, circa 1925-1935; and the octal, 1935-19-. In the front row: the loctal (left). and the popular 9-pin miniature tube. How Numbering System Worked. 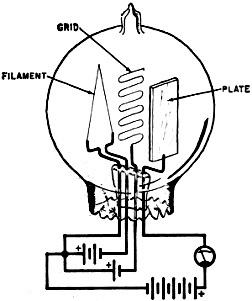 A type 6A3 was a tube with a nominal 6-volt filament (actually 6.3 volts), an amplifier type (A), with three active elements - filamentary cathode, grid, and plate. The 2A3 was a similar type, but with a 2-volt (actually 2.5-volt) filament. Similarly, the 6D6 was a tube with a 6-volt filament, an amplifier (D) type, with six active elements - filament, cathode, control grid, screen grid, suppressor grid, and plate. 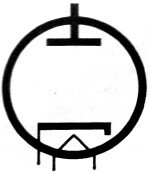 A 5Y3 was a tube with a 5-volt filament, rectifier type (Y), with three elements - filamentary cathode and two plates; the 5Z4 was similar, but with an extra element - an indirectly heated cathode. Unfortunately, even this seemingly ideal system was inadequate, for the introduction of new types soon outran available type numbers. Today, type number designations still use number-letter combinations, and the first number generally (not always) indicates nominal filament voltage, but the remaining part of the type number does not always hold to its original meaning. Tube Envelopes. 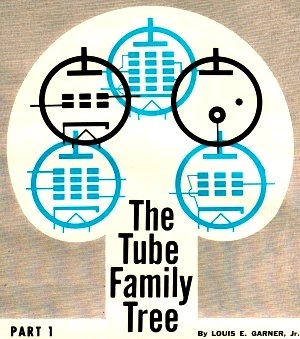 Tube construction techniques, too, have undergone many changes as the "family tree" has grown. Originally, tubes were assembled in glass envelopes almost identical to those used for incandescent lamp bulbs. Later, refined designs were introduced with connection pins which allowed tubes to be plugged into their sockets (rather than screwed in, as with lamp bulbs). Metal envelopes became popular because they carried the advantages of built-in shielding and were less prone to breakage than glass types. Special shapes were designed for high-frequency tubes to reduce electrode leads to minimum length ... such as the now-famous Acorn tube. Still later, miniature 7- and 9-pin glass types were developed. Today, the miniature glass tube is the most popular, general type, although several new types of construction have been introduced in recent years. Pentagrid Converter. As radio receiver circuits became more and more complex, multi-purpose tube designs became increasingly popular. The use of these permitted more compact receiver chassis layouts without, at the same time, compromising circuit sophistication. Some of these multi-purpose units were (and are) simply the elements of two or more tubes combined in a single envelope, but some special types were developed, the most popular of which is the pentagrid converter. The pentagrid converter has, as the name implies, five grid structures. Its primary application is in superheterodyne receivers, where it is used as a combination local oscillator and mixer. In operation, the cathode, control grid, and screen grid are used as the essential elements of a "triode" tube with appropriate components to form an oscillator. The incoming r.f. signal is applied to the second control grid (grid 2), which is shielded by the two-element screen grid. The cathode-to-plate electron stream is common to both control grids, hence the locally generated signal and incoming r.f. signal are combined in the stream and electrically "mixed" by the time the stream reaches the plate. The Compactron. Developed primarily for TV applications and representing the present-day "ultimate" in multi-purpose tubes, the compactron is a squat, 12-pin tube with a glass envelope similar to that employed with 7- and 9-pin miniatures (but broader) and may combine the functions of as many as three or four different tubes in a single unit. Ceramic Tubes. An ultra-miniature type designed for high-frequency applications, ceramic tubes are made up "sandwich-fashion" with alternate metal electrodes and ceramic spacer-insulators. They are used primarily in VHF and UHF receiver designs, in radar equipment, and in similar applications, although a few types have been designed for TV receiver and FM set work. The Nuvistor. Just as the compactron represents the present-day ultimate in multi-purpose tube construction, the nuvistor is the latest version of the metal envelope tube popular a few years ago. Nuvistors are manufactured in the basic generic types (triodes, tetrodes, etc.) and are extremely small physically ... not appreciably larger, in fact, than the typical transistor and actually smaller than some power transistor types. They are especially well suited to compact receiver design and are used extensively in TV, FM, and VHF receivers. Part 2 of this article will explore the transmitting tube "branch" of the tube "family tree," as well as the development of various types of phototubes and cathode-ray tubes.